Erin Gilbert (Kristen Wiig) and Abby Yates (Melissa McCarthy) are a pair of unheralded authors who write a book positing that ghosts are real. A few years later, Gilbert lands a prestigious teaching position at Columbia University, but her book resurfaces and she is laughed out of academia. 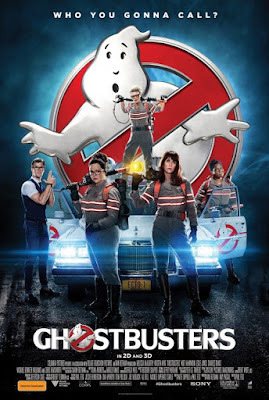 When ghosts invade Manhattan, Gilbert reunites with Yates, teaming up with a nuclear engineer, Jillian Holtzmann (Kate McKinnon), and a subway worker, Patty Tolan (Leslie Jones), to save the world from a mysterious evil and powerful demon known as Rowan (Neil Casey) who can exercise control over human forms. According to the trolls and haters, the movie bombed even before one word of the script was written. 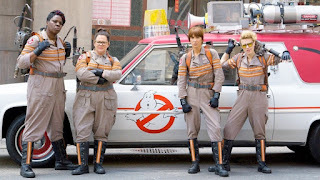 As a fan of the original franchise, and a lukewarm Melissa McCarthy fan, I have to say that I actually had a good time watching this Paul Feig's reboot. In place of the four originals, we have more or less stereotypical counterparts of them in the female form. But simply looking at this film as such is a grave injustice to the talented women and great writing that makes this a fun summer watch. As mentioned before, I am not the biggest fan of Melissa McCarthy. For me, her films are often hit or miss, perpetually rotating between the two. While she did okay, not great in this film, the standouts for me in this film are Leslie Jones and Kristen Wiig's character. Leslie had the better lines while Kristen just seemed to stand out more. Kate McKinnon's goofball character was more often incoherent than anything killing any joke that she may attempt at. Chris Hemsworth who plays dumb to such an extreme that you can't help to at some point hate the character as much as Jar Jar Binks from The Phantom Menace. Overall, the jokes like McCarthy's career are hit or miss, with no real consistency. Another disappointing factor in the film is the soundtrack. As the cassette owner of Ghostbusters II, the first soundtrack that I've ever purchased that the music was slamming, led by then Bobby Brown's On Our Own. Well slamming at least for its late 80's time period. The brightest stars for the film was its special effects and its clever inclusions of the original cast members. The final battle scene was amazing as well as Paul Feig and Katie Dippold's writing with the original stars. As with the latter, they were purposely included each separately in the latter part of the movies so not to overshadow the new cast which was a great idea. I particularly enjoyed Dan Akyrod's part which you'll find around the all out battle scene. 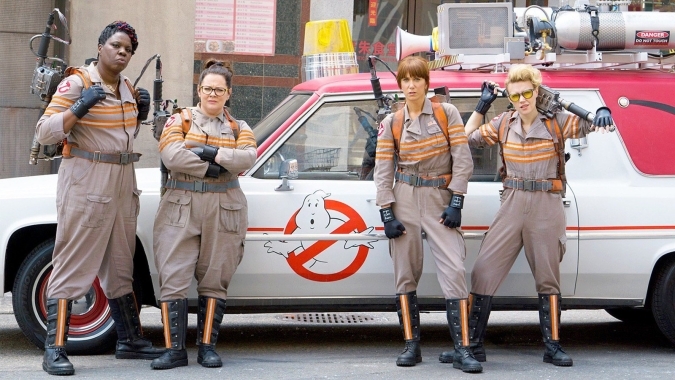 Overall, fans of the original Ghostbusters should enjoy the film. You'll find a lot of the same elements to the original films but at the same time the girls make it their own that you won't be able to help but enjoy on the big screen. Stay after the credits to see additional funny clips of the ladies and Chris as well in the final after trailer scene, a reference to an original villain from the original Ghostbusters film. The film releasing at the end of the week while not spectacular is a nice side track to every day life. As far as children, I would recommend ages twelve and up, ten if he or she doesn't get scared easily like my daughter does!